It was well past 11 p.m. when Tim McGraw walked off stage at CMAC Friday night, ending four hours packed with country hits from McGraw, Dierks Bentley, and Kip Moore. In that time, the temperature had risen past 100 degrees and oxygen felt limited. Fans thronged every inch of the stage to the ramps, and sang along with all of the musicians. McGraw played 22 songs, including "I Like It, I Love It," "The Cowboy in Me," "Something Like That," "Felt Good on My Lips," and my personal favorite, "How Bad Do You Want It?" Every song but one pounded at an incredible pace, several times up-tempo of studio versions, the one exception being a song McGraw said he had never played before on stage and that he sang by himself. McGraw is a showboat. There is no way around his style of performance upstaging the music. He comes out of the wings and, for the entire show, concerns himself with the physicality of touching fans, pounding his chest, shaking his fist into the air. He strikes dramatic poses, often with fully outstretched arms, and holds them in a pose for the sea of camera phones thronging him. What surprised me about the concert was an output that was more aggressive than it was musical. McGraw's studio versions, sung in a quieter voice, have a velvety twang, especially in songs like "Just to See You Smile." They warm a girl's heart. His studio recordings also allow the ear to hear the kinds of musical details that flow from fiddle, accordion, acoustic guitar, and a lighter touch of the drum set. 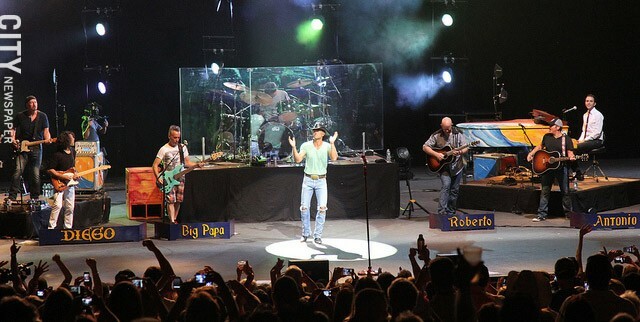 On stage, McGraw had no less than five guitars for nearly every song, including two dominant bass guitars. Consequently, McGraw pushed his voice to a need for drinking water, using throat sprays, and it even cracked during "Cowboy in Me" as he neared the end of the concert. Which brings me to Dierks Bentley's performance, which immediately preceded McGraw's. I walked in a fan; I walked out a FAN. From the very first note of "Feel That Fire," I was stunned at the quality of his voice, which far exceeded his studio recordings. Songs like "Come a Little Closer" became a serenade, especially when paired with a sincere smile, showing life-earned laugh lines. By the time he got to "Home," his rich voice had nestled in my heart. Bentley shared his passion for the music, and proved his ability to give freshness to every one of 14 songs. Bentley made me feel like we were out on a porch in his backyard in Nashville, friends, hanging out together, making good music and having a good time to songs like "Free and Easy (Down the Road I Go)." Bentley's individual band members brought some outstanding elements to the music. One guitar player, in particular, during "What Was I Thinkin'," flipped his guitar perpendicular to his body, and started picking those strings with his right hand and sliding up and down with his left. Whether it was picking, fiddling, or strumming, the balance between the instruments created a finely blended sound that had me dancing. 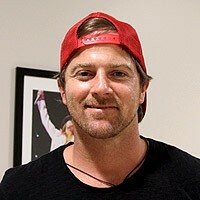 And a special shout out to Kip Moore, who opened the night. Moore brought a sweeter, easier voice and beat to the show, even while working up every woman in the audience with "Somethin' 'Bout a Truck" and bonding with every guy over "Beer Money." Moore and his band had a work-together style that delivered a professional show that tells you Moore is an up-and-comer. A final note about Moore: his fourth song out of five was a soft, sultry ballad, "Hey Pretty Girl." It was impossible to avoid the memories it triggered of early 1980's Bruce Springsteen, exhaling and whispering his way through "I'm On Fire," which opens with "Hey little girl is your daddy home." There's an acoustic version of Moore's song on YouTube from Country 98.7 KUPL. I'd urge you to watch it and tell me if he doesn't break you heart into bits all in the very first line. If I have one strong recommendation for Moore, it's to go that one step further as a performer and let that KUPL acoustic depth carry into the bigger stage shows.